Go Tours Canada is stoked to announce they’re turning 15 in 2019! 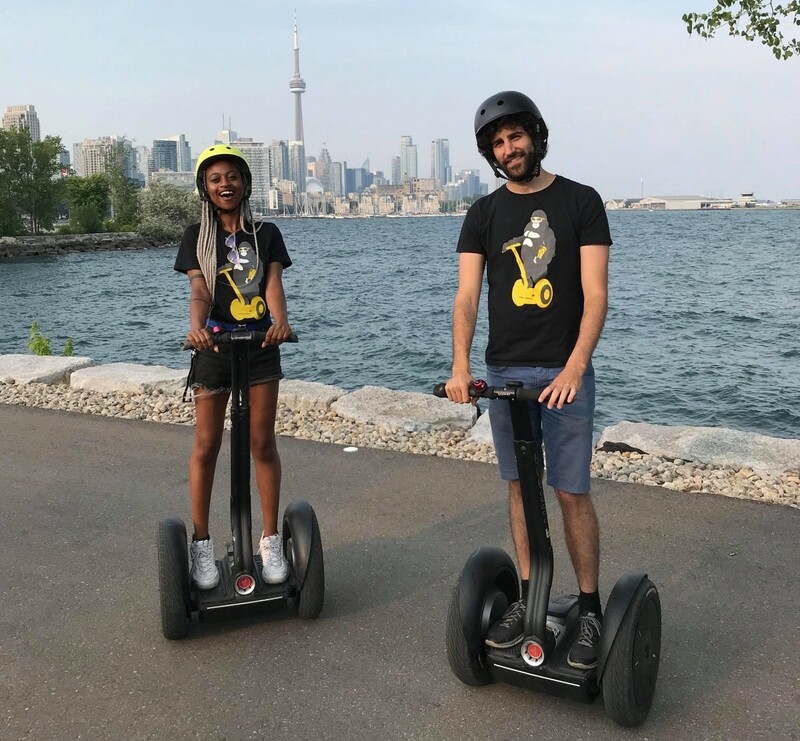 One of North America’s longest-running Segway tour companies, Go Tours is celebrating this year with discounts, giveaways and special events. Every 30 Minute Distillery District Segway Spin and 1 hour Classic Walking Tour during the month of February is Buy 1, Get 1. Whether it’s your 1st or 9th time to the Toronto Christmas Market, there’s something exciting to see in the Distillery District during the 2018 Market. As your resident guides to the Distillery District neighbourhood, we’ve got the goods and are here to dish. This year brings with it many of the known and loved Market activities. You’ll be able to snap a photo in front of the gorgeous Christmas Tree or giant heart. The Toronto Christmas Market team has also decked the buildings with waterfall style Christmas lights to create a magical, warming feeling as you walk down Trinity Street. If that’s not warm enough for you, grab a hot chocolate from Soma, Cacao 70 or any of the outdoor vendors slinging one of Canada’s favourite Winter drinks. If you’re looking for a more adult way to warm up, Spirit of York, Mill St. Brewery, and Izumi Sake all produce spirits on site that you can enjoy in their tasting rooms. On top of that, there are multiple beer gardens where you can taste spirits and other alcohol from around the globe. What better way to wash down a Hot Pretzel, Sausage or Turkey Leg than with a delicious beer? On Friday-Sunday night you can roam the 13 acres of Distillery District with some malty suds – a truly European experience in the Toronto Christmas Market! Want to get the lowdown on The Distillery District? Our award-winning Classic Walking Tour will take you inside the vibrant Victorian buildings dotting the Distillery. The incredible story of Gooderham and Worts rise to fame is almost too wild to believe. You’ll want to bring your friends, family, lovers and colleagues to this barn-burner of a story. We’ll even hook you up with some goodies with complimentary tastings at Soma Chocolate, Mill St. Brewery and a voucher for Hot Chocolate. You can get more info and book here. Whatever you do during the 2018 Christmas Market, we hope you enjoy yourself! My name is Aaron Binder and I’m one of those Little Guys you constantly talk about. For years, my business, Go Tours Canada, has been a leader in Ontario’s Tourism Industry. We’ve helped transform our Province into a global Tourism destination and created prosperity for our employees, the local economy, the tourism industry, and the Province. In July 2018, we opened our third Ontario location at Ontario Place. We were attracted by their plan to partner with small businesses like mine to drive incremental, long-term revenue. Their growth strategy to turn the beleaguered location into a waterfront hub was impressive and we decided to invest in a partnership. I’m writing you today because I believe that if you truly understood what it is you are doing you would proceed differently. Because of your decision to axe Ontario Place I will now have to axe the new employees we hired this year. We may just be Little Guys, but we’re also job-creators who want stability for ourselves and our employees. This move, your move, jeopardizes that. Premier, I’m with you when you say Ontario needs to attract investment, but not when it costs Small Businesses. Over 80% of Canadians own or are employed by Small Businesses. Canadians want Small Businesses, they don’t want you to hand over our most valuable land, potentially to foreign investors. Ontario Place can become one of our Province’s most popular destinations and not much needs to change to make it happen. Let’s keep building the long-term plan that years of work has gone into making. You will see the return on investment. Axe the plan and you’ll be compared to Dalton McGuinty in 2011 when his government slashed Ontario Place for the first time, or to Kathleen Wynne after canceling the gas plants. Let’s work together and stay the course, it’s a good one.